Dwayne “the Rock” Johnson is a bonafide superstar. From his very successful reign as one of the most popular wrestlers in the WWE to his transition into full blown action star, you can see that The Rock is one of the toughest guys in entertainment. It’s all the more believable when he body slams Vin Diesel through a car with ease. Even though the indomitable Rock can easily put a guy’s head through a wall, he has a soft spot for little puppies, and has been known to risk life and limb for his French bulldogs. 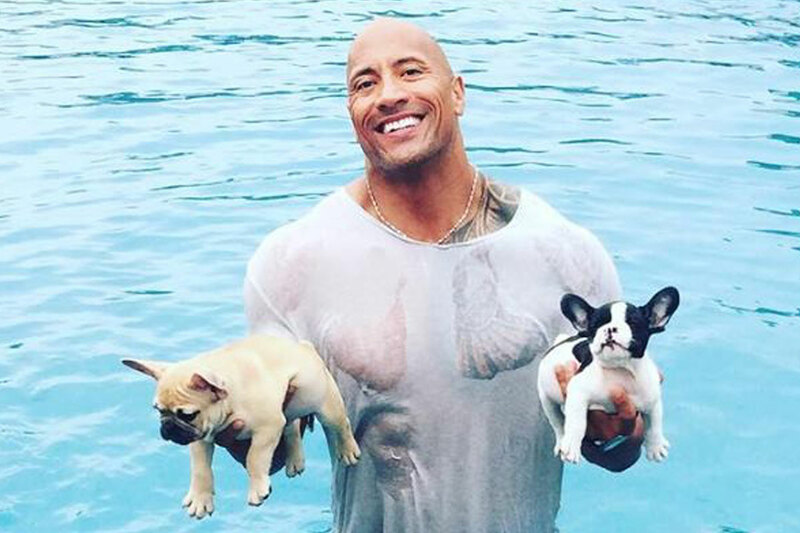 Here is Dwayne Johnson in a pool with two of his fuzzy buddies, after reports of him rescuing the bulldog puppies from drowning in a pool first came out. Thankfully for these little guys, The Rock is not only dedicated to dominating the WWE and saving the world on the silver screen, but also to lending a hand to cute critters in distress!